For the CIAO 4.9 / CalDB 4.7.6 release notes see How CalDB 4.7.6 Affects Your Analysis. 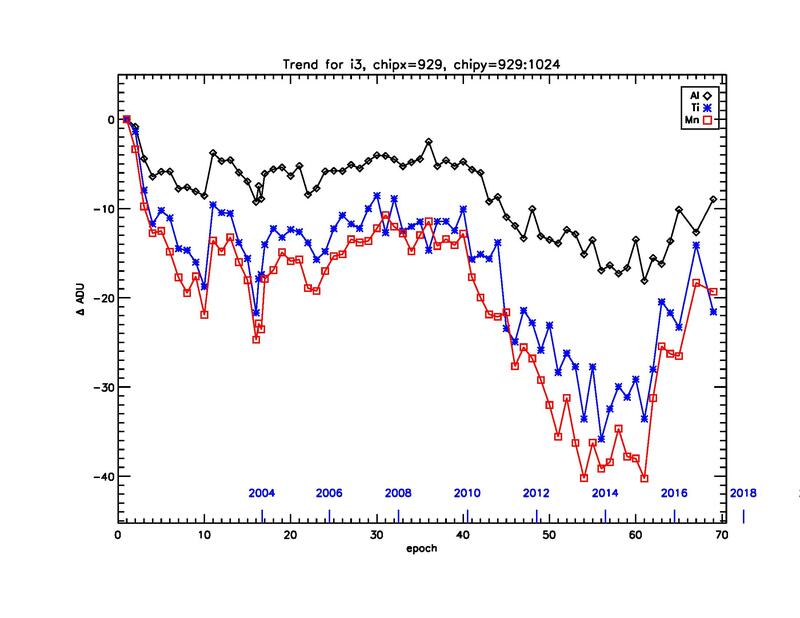 The ACIS Calibration team has released new time-dependent gain corrections derived from the External Calibration Source (ECS) during quarterly Epochs 69 (February-April 2017) and 70 (May-July 2017), which have been combined to obtain sufficient counting statistics. With this release, the combined epoch 67+68 CalDB files may be finalized. Users with observations taken between 2016-11-01 and 2017-05-02 are advised to reprocess with their data with finalized versions of the applicable T_GAIN files. Users with observations taken since 2017-05-02 will have access to an updated provisional T_GAIN file (one of the version N0002 filenames above); They will not however have a finalized file until after Epoch 72 (Nov. 2017 through Feb. 2018) is completed. The files in bold above have been regenerated to replace these faulty version N0001 files. This effort has given us the opportunity to correct a couple of header keyword specifications in the BKGRND generating scripts, such as setting the TSTART and TSTOP values to be REAL4 types instead of defaulting to INT2. The repaired scripts have been used to recompile the remaining Group G BKGRND_CTI files above, and hence the whole set is being replaced with this release. See the technical details section below for more information on the new background datasets. CIAO script blanksky, which uses acis_bkgrnd_lookup to search for these BKGRND event lists, is used to tailor the background to specific observations. 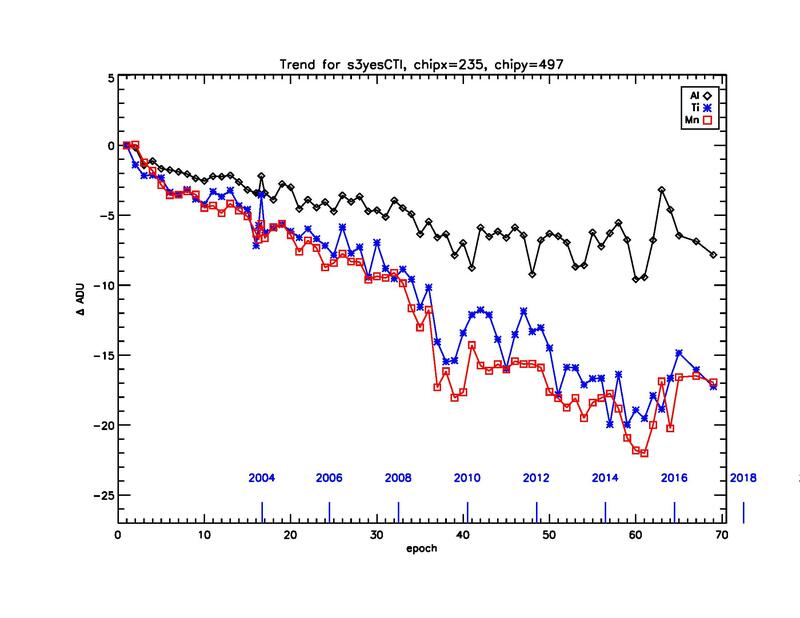 The ACIS T_GAIN epoch 69+70, combining two quarterly epochs, and covering the period of Feb through Jul 2017 has recently been completed, and the ACIS External Calibration Source (ECS) radiation zone data has been reduced as per some modified procedures, to generate the time-dependent gain correction tables for this epoch. The procedural modifications were made to address the decreasing statistics available from the ECS due to its natural decay in count rates. The two epochs are being combined to produce a single new T_GAIN correction update. Long term trends for chips I3 and S3 are plotted below in Figure 4a and b, through Epoch 69+70, which includes the latest release. The chip locations for these plots are given in the respective labels above the plots. The chip locations selected are near the aimpoints, as with Figs 1 and 3 above. The full CTI correction has been applied to the data in both figures. Figures 1 and 4a show a reduction in the T_GAIN correction at high photon energies for the most recent epochs. This seems to correlate with the increased particle background rate which corresponds with the current decrease in solar activity. This is not unexpected for the FI chips, which are more affected by the particle background. Note that this trend is not nearly as evident in the BI chips (Figs. 2, 3, and 4b), which is also to be expected.